Welcome to Wine Quiz number 17. Please choose from the list of possible answers to each question. 1: Rueda wines come from which country? Made from Verdejo and sometimes Sauvignon Blanc, these wines come from the north of Spain. 2: I’m a blend of Graciano, Mazuelo and Tempranillo. What am I? These three grapes are found together in Rioja, with Tempranillo the most prominent of the three for most bodegas. 3: In France, ‘Appellation Controllee’ has officially become what? Though Appellation Controllee is still permitted on labels, officially across Europe this classification of wines is now AOP (Appellation d’Origine Protegee). 4: How much residual sugar is in a Champagne labelled as ‘Extra Dry’? Extra-Dry is actually sweeter than ‘Brut’ but a little less sweet than ‘Dry’. Confused? You should be! Coulure is a viticultural problem, a metabolic reactions to weather conditions where grapes fail to develop. 6: Fermenting in small oak barrels is common for which variety? Though many wines are aged in small oak barrels, most are feremented in steel or concrete tanks and transferred to barrels after fermentation. Chardonnay is one variety that is often fermented and aged in barrels. 7: In which country is the wine region of Carnuntum? This is in eastern Austria, not far from Vienna. 8: Which Australian Wine Region is this? This is the remote region of Margaret River, two hours south of Perth. 9: Which red wine had to be made with a proportion of white wine grapes until the 1990s? Legally, Chianti wines had to contain some white grapes until relatively recently. One of the reasons for the development of the ‘super-Tuscans’. 10: What is a ‘Gyropallette’ used for? These rotating palates replace the skilled manual job of ‘riddling’ – rotating bottles in preparation for disgorgement. Pinot Blanc is the third variety permitted in the Italian sparkling wines of Franciacorta. 12: Biodynamic winemaking aims to completely ban the use of what? Use of others in the list may be discouraged or minimized, but the use of cultured yeasts is not permitted. Negrette is almost uniquely used in Fronton to make red and rose wines. These are free-standing bush vines, looking soemthing like gobolets. 15: Why is this tank of wine so icy cold? 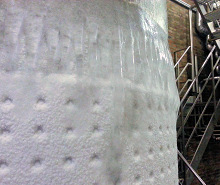 The wine is being cold stabilised, which will stop the formation of tartaric crystals in the bottle. 17: Which of these areas is famous for its granite soils? Beaujolais is famously on granite, with some areas rich in maganese too. Savagnin Musque is the same grape as Gewurztraminer with a similar pink skin. 19: Which wine region lies south of the town of Livorno, close to the Tyrrhenian Sea? One of the most expensive sub-regions of Tuscany and home to several ‘super-Tuscans’. 20: Which famous wine label carries an illustration of The Keys of St Peter? The super-expensive Pomerol wine, Petrus is the answer.